So... you've decided to move to the Poconos? Great! Seriously... you're gonna love it here. There's a lot to do, or if you are moving for the peace and quiet, this is available, too. IF you know where to live. For every mile you drive west from the Delaware Water Gap you can expect to pay about $1,500 less for the same exact house. This is because of the demand created by New Jersey and New York commuters. Communities with dues are not necessarily a good buy. You should purchase a home in a community when you are absolutely sure the amenities will provide value for you and/or your family over time. Think of dues as additional taxes. Taxes are to provide services. If you don't use the services, why pay the tax? And what is important here is to consider the future. If you find value in the pool, tennis court and clubhouse for your children, weigh in your decision just how long you expect them to be living with you. If only for a few years, you might be better off living outside a community and joining a local YMCA. Selling the house after you find they are gone and you are not getting value for the amenities can be costly, with transfer taxes, commission and etc. In the woods or in town? There's not much suburbia here in the Poconos, with the large amount of State, Federal and local parklands and unbuildable property because of terrain and wetlands, we all seem to live either in the woods or in town. If you want to live in town, you'll probably end up in an older home requiring more maintenance. If in the woods, well.... there are animals to contend with along with a drive of a few miles for the basics. Plan on paying for a fairly new car that you will keep in top condition if you choose to live outside of town. At least two if you have 2 or more drivers. Resale or new? If you would never buy a used car ... the decision is already made... you are going to build. If you enjoy tinkering and fixing, a resale is more likely your choice. But, some of you fixers are going to find out you just can not find the house you want in the resale market... and you'll be converted to building. 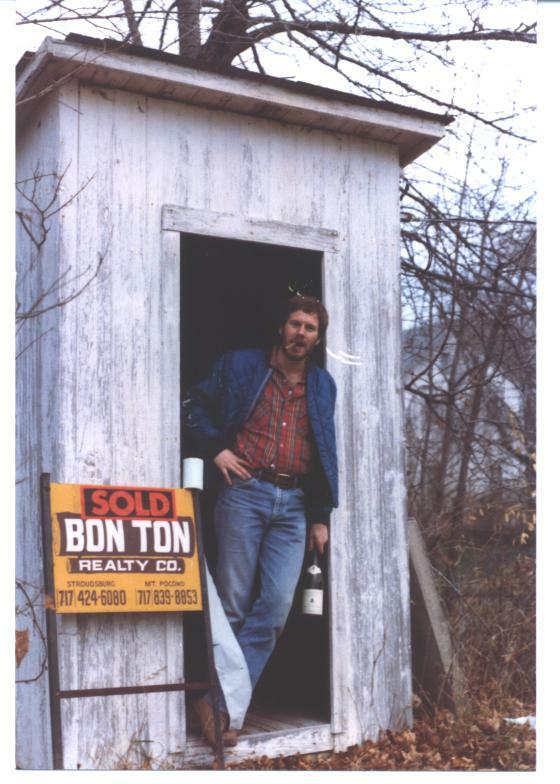 Here in the Poconos there is very little cooperation between real estate brokers and builders. This is unlike the rest of the world. Here, if you ask most Real Estate Brokers to guide you through the maze of builders .... you'll just get a blank stare and an offer to show you another farmhouse. Find the right Real Estate Broker, though and he/she can be invaluable in helping you find the right builder for your lifestyle and help you understand, objectively the pricing structure. Who Knows More About the Poconos? -- "Agent... how long have you lived here?" We get a lot of people moving to the area who fancy they would like to sell homes.... yet know little about the roads, neighborhood amenities, community restrictions and zoning, building codes and etc....if the answer is "less than 10 years"... move on and find another agent. -- "Agent.... how many buying transactions have you handled?" If the answer doesn't come back in the hundereds....move on and find another agent. Or ask he/she to partner with a more experienced agent to handle your transaction. -- "Agent... where should I go for a mortgage?" If the first answer is "a mortgage broker ?" and not "your current bank" or a "local bank".... be careful there may be an affiliation and you may not be getting the best deal. Many mortgage brokers just process your package, add fees on top and send the information to a local bank anyway. You don't want to pay the extra fees. -- "Agent... Should I use an attorney?" The answer should be "Yes, let me recommend a few for you to contact, and at least, have them review the agreements" AND he/she should recommend at least three. See PoconosBest.com Real Estate Attorneys for a list of Specialists. As mentioned earlier, Builders and Real Estate Agents, traditionally are at odds here in the Poconos. But, I think that you SHOULD have an agent work with you through the process of purchasing a new home. Just be sure to have the right agent. One with experience in new construction. He/she can help you understand the process, the financing issues, and provide some guidance through the selection of a neighborhood and builder. If you've selected the right agent he/she will know the market, location issues and reputation of the builder. Select an agent prior to registering at any new home model you visit. Discuss with your agent whether the home you want must be new or whether you can find a similar home in the resale market for less. Then have your agent accompany you to the new home neighborhoods and models. He/She can offer advice about the home and neighborhood, insulate you from any pressure in the sales process and suggest other communities or builders for you to consider. Questions? Why to Buy -- House too small? Just need to get away more often? Coming to the mountains a lot and want to save on hotel bills? Down The Shore too expensive? Need a tax deduction? Rent or Personal Use: Decide in advance if renting the home is important to you. (Or if you need to, to afford it.) If so, the location of your new rental home is the most important factor to consider. The best grossing rental homes are next to ski mountains. This is a supply and demand issue. Skiers will pay more to be near the slopes and since, in the summer, most ski areas have activities like waterparks or festivals, homes adjacent are also, in demand. Conversely, if you have a "house in the woods" or in a "lake community" there may be some "one season" demand but, if that season is the summer ... there is, also, a much larger supply of homes available for rent and the rental rates are substantially lower. 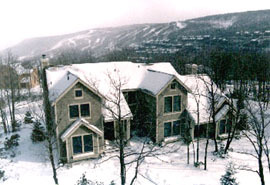 See PoconosRentals.net for information on seasonal variations in rental rates. Unlike other areas, there are only a few real estate brokers that "makes a market" in rentals. Other than Baxter at Lake Naomi, and USA Realty at Camelback most brokers are unsuccessful with rentals and shy away from renting homes other than as a method to get homeowners in the door to establish a contact for a later sales listing. Many, many homes are rented by the homeowner's themselves by placing ads in newspaper and online sites like PoconosBest.com. Where to Buy -- Location Determined By Amenity Choice. Lakefront, lake rights, river front, view, proximity to ski slopes, stream side, tennis courts, social activities at a clubhouse are some of the amenities that might drive you to a particular home. You can expect to pay a premium for these choices.. it seems to run in this hierarchy Lakefront, Long view, Golf Course, short view, riverfront, streamside, lake rights, access to tennis and pool. Currently large lakefront lots are in hundreds of thousands for the lot, long views around $150,000, ski slope $125,000 and if any view is combined it will be more. Add this to the cost of the home (anywhere between $90 per sq.ft.to $200 per sq. ft.) and you can estimate what you can expect to pay. Lakes are scattered about the mountains with only two or three of any size that allow boats with motors. There are five ski areas with homes adjacent (in order of size of ski area) Camelback, Shawnee, Jack Frost, Big Boulder, & Alpine Mountain. The vacation homes, near skiing, experiencing the most appreciation seem to be at the ski resorts in the same order. Questions? Streamside homes are mostly in second home communities scattered throughout the area. 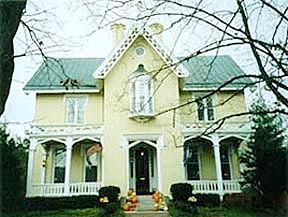 River front homes are generally on far east (The Delaware) or the far West (The Lehigh). These both run high risks of flooding ... so there are very few available (with not a lot of demand). Most "gated" communities and a few ungated "Vacation" neighborhoods have tennis and pool(s) some indoor and some out. The important thing to be aware of if you buy in a neighborhood with these tow amenities is that a pool (especially and indoor pool) is expensive to maintain and operate. Due will be substantially higher in these neighborhoods and others. So... If you can do without the pool.. you should probably not consider a community with one. Expect to pay more for financing than you would on a primary home. -- Most banks require either more than 20% down or a higher interest rate on a second home. They also like to see the term about 20 years. This is to reduce their risk. Many, Many people purchase a second home with an equity loan on their primary residence. (Costs are less and the rate is usually better) IF they have the equity available. There may be some tax advantages, (see your accountant).